Human liver cell bioreactors are used in extracorporeal liver support therapy. To optimize bioreactor operation with respect to clinical application an understanding of the central metabolism is desired. A two-compartment model consisting of a system of 48 differential equations was fitted to time series data of the concentrations of 18 amino acids, ammonia, urea, glucose, galactose, sorbitol and lactate, measured in the medium outflow of seven liver cell bioreactor runs. Using the presented model, the authors predict an amino acid secretion from proteolytic activities during the first day after inoculation of the bioreactor with primary liver cells. Furthermore, gluconeogenetic activites from amino acids and/or protein were predicted. 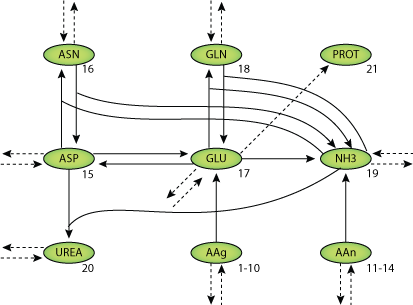 'Dynamic Model of Amino Acid and Carbohydrate Metabolism in Primary Human Liver Cells', Reinhard Guthke, Wolfgang Schmidt-Heck, Gesine Pless, Rolf Gebhardt, Michael Pfaff, Joerg C. Gerlach, and Katrin Zeilinger, 2006, N. Maglaveras et al. Eds. ISBMDA, 137-149. Structure of the model Equations. Derived from workspace Dynamics of amino acid metabolism of primary human liver cells in 3D bioreactors at changeset 6b155b15f687.